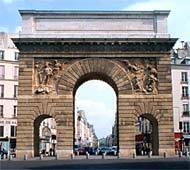 Two triumphal arches, at the Porte Saint-Martin and Porte Saint-Denis, were commissioned by Louis XIV to commemorate his military victories. Ever since 1670, reinforcement of France's northeastern borders had allowed the removal of fortifications surrounding Paris, and this circumference was transformed into verdant promenades. During the centuries that followed, they were to become the "grand boulevards"(1) of Paris. Symbolically marking the entrances into 17th-century Paris at the sites of the old toll-gates, these two triumphal arches served only an ornamental function. Their sculptures and bas-reliefs celebrated the King as a head of war. Construction of the Porte Saint-Martin immediately followed that of the Porte Saint-Denis in 1674, and it was likewise paid for by the city of Paris. A Latin inscription at the summit of the south façade proclaims, "To Louis the Great, for having vanquished the German, Spanish, and Dutch armies: the Dean of the Guild and the Aldermen of Paris." The two bas-reliefs on the south façade represent the taking of Besançon (see Province of Franche-Comté) and Louis XIV in the act of crushing the Triple Alliance. The north façade depicts the taking of Limbourg and the defeat of the Germans. Although Louis XIV favored living at Versailles, he championed the urban development of Paris, instituting a Department of Roads to ensure that city streets were cleaner and well-lit. Historical factoid: Saint-Martin once had its own métro stop, situated between Strasbourg-Saint-Denis and République. It was closed at the beginning of World War II (September 2, 1939) and reopened upon the Liberation of Paris (August 25, 1944). However, it was soon shut down again  this time permanently, judged to be too close to its neighboring stations. Saint-Martin is the largest of all closed métro stations in Paris, and still features the old porcelain tiled advertisements on its walls. In recent years, it has been put to use to house some homeless souls during the coldest winter months. (1) The word boulevard is derived from an old German word bulwark, meaning the top surface of a rampart or the artery that replaces a rampart  which testifies to the military origin of its layout. Location: Intersection of where rue St-Martin changes to rue du faubourg Saint Martin, and where boulevard St-Denis changes to boulevard St-Martin, 75010 Paris. Métro: Strasbourg-Saint-Denis (lines 4, 8, 9). Bus: 38, 39, 47. Admission: There is no public access to the inside or top of this monument. Edited by Ian C. Mills, © 1999-2005  All Rights Reserved. Bibliography: Around and About Paris - Vol. 2, by Thirza Vallois (1998, publ. Iliad Books); Voila.fr Tourisme; Marx & Engels Internet Archive; Reveland.com; Forgotten NY; Pariserve Découverte; Paris Balades. Other resources: Louis XIV of France (Wikipedia entry); Louis XIV Foreign Policy. 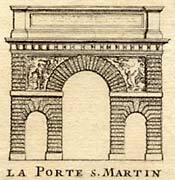 Image sources: Copperplate engraving of Porte Saint-Martin, Giffart (1706), from Lombard Antiquarian Maps & Prints. Photos of Porte Saint-Martin (front & rear views), © 2003 Ian C. Mills and DiscoverFrance.net. All Rights Reserved. A prodigious painter to the age of 87, the well-loved and -respected Galien-Laloue (1854-1941) painted many landscapes but preferred to depict street scenes of Paris  all very architecturally accurate. At least two of his works were of the Porte Saint-Martin. Wikipedia  the free online encyclopedia  provides an overview of the Sun King's reign, with links to relevant articles. Part of the World History at KMLA site, this page offers a synopsis of the politics of war practiced by Louis XIV, plus links to external resources. Although this ancient gate to medieval Paris is long since gone, just like the Bastille fortress and prison beside it, it's possible to see several historical renditions of both the gate and the Bastille complex. The young, half-mad alcoholic painter from Montmartre, Maurice Utrillo (1883-1955) rendered his oil-on-cardboard depiction of the Porte Saint-Martin around 1909. It is on exhibit at the E.G. Bührle Collection in Switzerland. Take a look at various views of the Porte Saint-Martin, including an antique copperplate engraving, paintings by respected artists, B&W postcards from the turn of the last century, and modern-day color photos. The Charles Deering McCormick Library of Special Collections has amassed a noteworthy archive of photos documenting the horrible destruction wrought during the Siege and Commune of Paris, including that of the landmark theatre. The second volume in a three-volume set offers fascinating historical information and recommended walking tours for the 8th through the 12th arrondissements of Paris. Highly recommended reading! Nominate A Site, or Publish An Article! Do you know of a great site we should list here? If so, please submit it! Are you an author, educator, student or traveler who would like to write an article  or submit your photographs  for the enjoyment of our francophile community? Please download our author's guidelines (48K PDF). Thank you!